NASA’s long lived Opportunity Mars rover has completed a three month long exploration of Santa Maria crater along the trail towards its biggest target ever, Endeavour crater, some 22 kilometers in diameter. Santa Maria has simultaneously offered a series of stunning vistas and a scientific bonanza as a worthy way station in the rovers now seven year long overland expedition across the Martian plains of Meridiani Planum. Opportunity made landfall at the western edge of Santa Maria on Dec. 15, 2010 (Sol 2450) after a long and arduous journey of some 19 kilometers since departing from Victoria Crater nearly two and one half years ago in September 2008. Santa Maria is the largest crater that the rover will encounter on the epic trek between Victoria and Endeavour. The science team decided that Santa Maria would be the best location for an intermediate stop as well as permit a focused science investigation because of the detection of attractive deposits of hydrated minerals. The stadium sized and oval shaped crater is some 80 to 90 meters wide (295 feet) and about nine meters in depth. Opportunity has since been carefully driven around the lip of the steep walled crater in a counterclockwise direction to reach the very interesting hydrated sulfates on the other side. The rover made several stops along the way to collect long baseline high resolution stereo images creating 3 D digital elevation maps and investigate several rocks in depth. Opportunity was directed to Santa Maria based on data gathered from Mars orbit by the mineral mapping CRISM spectrometer – onboard the Mars Reconnaissance Orbiter (MRO) – which indicated the presence of exposures of water bearing sulfate deposits at the southeast rim of the crater. “Santa Maria is a relatively fresh impact crater. It’s geologically very young, hardly eroded at all, and hard to date quantitatively,” said Ray Arvidson from Washington University in St. Louis. Arvidson is the deputy principal investigator for the Spirit and Opportunity rovers. The rover had to take a pause anyway in its sojourn to Endeavour because of a restrictive period of solar conjunction. Conjunction is the period when the Sun is directly in between the Earth and Mars and results in a temporary period of communications disruptions and blackouts. During conjunction – which lasted from Jan. 28 to Feb. 12 – the rover remained stationary. No commands were uplinked to Opportunity out of caution that a command transmission could be disrupted and potentially have an adverse effect. Advantageously, the pause in movement also allows the researchers to do a long-integration assessment of the composition of a selected target which they might not otherwise have conducted. By mid-January 2011, Opportunity had reached the location – dubbed ‘Yuma’ – at the southeast rim of the crater where water bearing sulfate deposits had been detected. A study of these minerals will help inform researchers about the potential for habitability at this location on the surface of Mars. Opportunity at rim of Santa Maria crater as imaged from Mars orbit on March 1, 2011, Sol 2524. Rover was extending robotic arm to Ruiz Garcia rock as it was imaged by NASA’s MRO orbiter. Opportunity snapped a collection of raw images from ‘Yuma’ which Marco Di Lorenzo and myself assembled into a panoramic photo mosaic (shown above) to illustrate the location. The high resolution version was selected to appear at Astronomy Picture of the Day on Jan. 29, 2011. The rover turned a few degrees to achieve a better position for deploying Opportunity’s robotic arm, formally known as the instrument deployment device or IDD, to a target within reach of the arms science instruments. “Opportunity is sitting at the southeast rim of Santa Maria,” Arvidson told me. 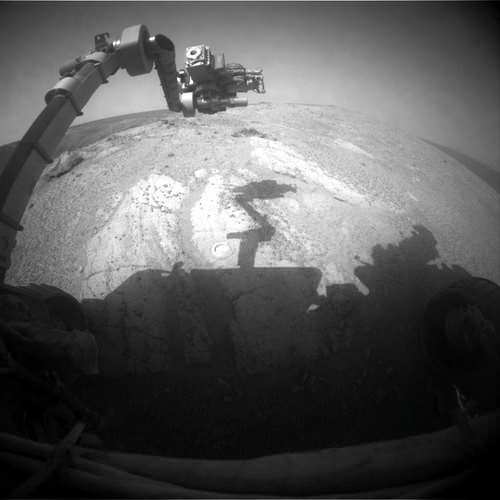 “We used Opportunity’s Rock Abrasion Tool (RAT) to brush a selected target and the Moessbauer spectrometer was placed on the brushed outcrop. That spot was named ‘Luis De Torres’, said Arvidson. Opportunity successfully analyzed ‘Luis De Torres’ with all the instruments located at the end of the robotic arm; including the Microscopic Imager (MI), the alpha particle X-ray spectrometer (APXS) and then the Moessbauer spectrometer (MB) for a multi-week integration of data collection. 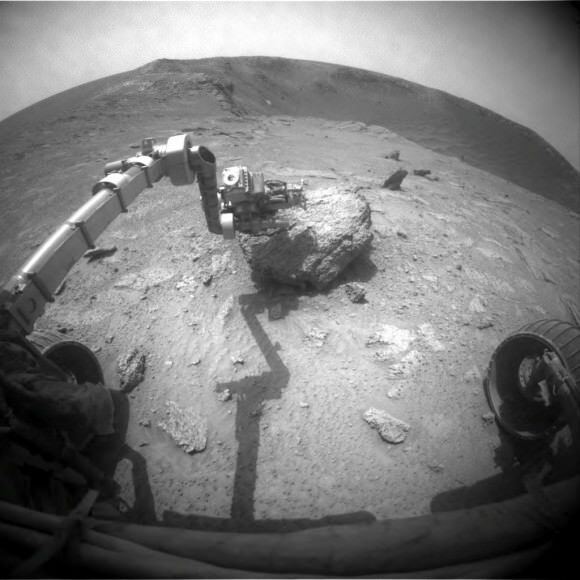 After emerging in fine health from the conjunction, the rover performed a 3-millimeter deep grind on ‘Luis De Torres’ with the RAT in mid-February 2011 to learn more about the rocks interior composition. Opportunity then snapped a series of microscopic images and collected spectra with the APXS spectrometer. The rover then continued its counterclockwise path along the eastern edge of the crater, driving northwards some 30 meters along the crater rim to a new exposed rock target – informally named ‘Ruiz Garcia’ to collect more APXS spectra and microscopic images. See our mosaic showing “Ruiz Garcia” at the lip of the crater (above). Opportunity finished up the exploration of the eastern side of Santa Maria in March by snapping a few more high resolution panoramas before resuming the drive to Endeavour crater which lies some 6.5 kilometers (4 miles) away. Endeavour is Opportunity’s ultimate target in the trek across the Martian dunes because it possesses exposures of a hitherto unexplored type of even more ancient hydrated minerals, known as phyllosilicates, that form in neutral water more conducive to the formation of life. One of the great things about sending two rovers to Mars is that when a rover dies, the mission can continue. I wish NASA could have done the same with the new Curiosity rover. The economics of scale goes against investigations. Generally you can start out wide and can cover much of the problem cheaply. As you concentrate and deepen your search, the cost of instrumentation goes up at the same time as the ROI of multiple system decreases dramatically. It is understandable to make a cut sooner rather than later, but it is not a good argument against wishes. Or even multiple search as of yet. For one thing we don’t know if Curiosity will hit pay dirt! It should if life survived the CO2 lockup of minerals. But if not evidence for early life now seems buried in newly discovered carbonates several km below later deposits. The crater upcasts of those layers are fairly easily accessible, if not voluminous. But it would take a paleontologist to say if existing fossils or trace fossils such as isotope ratios survive impact events. * Who knows, since it isn’t the usual environment for preservation of fossils maybe even they don’t know yet. * I’m not optimistic on that. “the CO2 lockup of minerals” – the CO2 lockup in minerals. Incidentally the easiest survival environment would be around those carbonates, since the old water systems that helped form them should leave residuals associated with them, as far as this layman understands. You don’t even need volcanism for heat if the buried water/mineral system leaves unequilibrated chemical potentials around for energy, as they should. When will we hear what form of hydrated sulfates were found? Probably either copiapite (iron sulphate) or sodium or potassium copiapites. Most are found in coal mines and shales, so I’d assume your trying to make a indirectly connection to some form of Martian life. They could be formed by meteorites that has fallen in water or damp soils. Look forward to Ken’s story, too. I’m curious about the Sand dunes in the Crater. Wish they would drive down and sample them. Why are they darker (or black blue in some cases) I understand that dark volcanic rock basalt is likely to be what they are composed of, but as they are distinct from their surroundings I begs the question; Why hasn’t this been covered up by the much more abundant red soils. What keeps the dunes dark ? Earth deserts are known to sublimate sodium minerals and deposit them near the underground water table. Its possible that mars dunes also play a similar role with CO2 or other minerals. Lastly is it possible that a form of life remains in the Sand Dunes ? A logical train of thought might surmise that these are established protected landforms that are subject to a aeolian deposition and renewal process. (a dynamic system) that “could’ be utilized by a lifeforms. I would guess that heavy particles are trapped in a crater. When dust and sand get into the crater, wind is able to blow out the lightest fraction of the particles while the rest accumulates and forms dunes. On open ground the heavier particles are able to roll on untill they are trapped somewhere. Maybe the heaviest particles happen to be relatively abundant of dark-colored materials. Of course it would be nice if your theory of life in the dunes is right. However I think it’s unlikely. On Earth sanddunes are not the environment where life flourishes, especially if they are very dry..